CP Manufacturing, headquartered in San Diego, CA is proud to announce the celebration of their 35 year anniversary this year. CP has been supplying equipment to the recycling industry since 1977. CP’s story begins in the scrap metals industry when IMS Recycling, CP’s parent company, was founded in 1954 by Charles M. Davis. In the early 1970′s, IMS developed an aluminum can reclamation program. The program grew and so did the need for separation and volume reduction equipment, which lead Davis to invent the world’s first aluminum can flattener – the CP100 – for use in his own yard. In answer to the demand from other companies to purchase the CP100, CP Manufacturing was founded and is now headed by the late Charles Davis’ son, Bob Davis. CP has grown significantly since its time of the can-flattener days. For 35 years, CP has been at the forefront of the recycling evolution, providing custom material recovery facilities and solutions; CP has custom engineered, manufactured and installed over 400 material recovery facilities world-wide. Bob Davis saw that strategic acquisitions of other industry-proven companies would add to the success of the organization, and ensure CP provides the best integrated solutions for its customers. He recognized the whole is greater than the sum of its parts, and has acquired 4 companies since 2003, forming the CP Group. 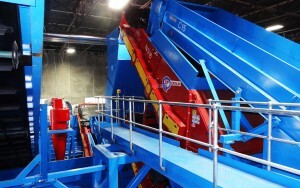 “From the beginning, CP has been an integral player contributing to the growth and success of the recycling industry. The foundation of the CP Group puts us in an even stronger position to further support this growing and constantly evolving industry,” says Bob Davis. In 2003, CP made its first acquisition, MSS Inc., a manufacturing division specializing in advanced optical sorting equipment. In 2005, Krause Manufacturing was acquired. Krause manufactures heavy-duty construction and demolition, municipal solid waste, and front end waste-to-energy systems. In 2008, IPS Balers was acquired, allowing CP to offer an innovative line of balers with their systems. In 2012, CP made its latest acquisition, Advanced MRF, a Siemens solution partner specializing in intelligent motor control systems. Advanced MRF not only provides energy-efficient solutions, but also enables all equipment, from the IPS baler to the MSS optical sorter, to communicate and provide seamless system integration and effective measurement tools. CP, MSS, Krause, IPS Balers and Advanced MRF are the 5 companies that form the CP Group. The CP Group will provide the total solution for any material recovery facility, from the tip floor to bale storage, and all the equipment in between. “We have a really strong team here. Each of the 5 divisions of the CP Group has a specialty and an expertise so we can deliver the best solutions to our customers, from every angle,” says John Willis, President of the CP Group. The CP Group has innovative ideas for the future. With dedication for continuous improvement, CP looks forward to sharing its latest solutions with the waste and recycling world that will lead to further customer success and a more environmentally-sound planet.